Warning: Minor spoilers ahead. Nothing major, but if you like to read a novel with ABSOLUTELY NO IDEA what comes next… well, you’ve been warned. This is an unusually high rating for me to give out (if it sometimes seems like all my ratings are three or above, it’s generally because I [a] don’t bother finishing books I don’t like and [b] know myself pretty well and tend to be a good picker of books), so let me begin by saying that this book actually affected me. I don’t think I’m a callous person, but I generally read a book, enjoy the story, delight in the language, take sides with the characters I like, and then put it down when I’m done and move on to the next one. I finished Jamrach’s Menagerie several days ago (and I’ve read two other books in the meantime), but I’m still thinking about it. I mentioned in my last review that Casino Royale had one of the most peculiar narrative arcs I’d ever seen. Ian Fleming just lost that title to Carol Birch. Jamrach’s Menagerie is in possession of a narrative arc so utterly bizarre that at first I had no idea what to make of it – but now I’m starting to see that the strangeness of the storyline contributed more than I originally realized to the freight train impact of the plot. Jamrach’s Menagerie (based in part on the true story of the whaleship Essex) tells most of the life story of Jaffy Brown, a poor boy living in the Victorian hell-hole of Bermondsey until he inexplicably finds himself trapped in the mouth of an escaped tiger, belonging to one Mr. Charles Jamrach (who was a real person, and did once rescue a small boy from a tiger), the keeper of an exotic animal emporium on the colorful Ratcliffe Highway. Jamrach’s titular menagerie (though it has surprisingly little to do with the real meat of the story) takes the tale from the drab shite-brown backdrop of Bermondsey and thrusts its into a technicolor world of tropical birds, gators, wildcats and Tasmanian devils. There’s certainly an element of the fantastic present, though it’s never overtly discussed. A giraffe, in the eyes of a young boy from the mud beneath the London docks, is more than exotic enough to feel like magic. This taste of the ‘stuff of legends’ grows a little sharper when Jaff and his new friend Tim Linver (another boy in Jamrach’s employment) are swept out to sea on the Lysander in search of a ‘dragon’ – which, if they can catch it, will be by far the most ambitious addition to Jamrach’s emporium. As they hop from one tropical island to the next the boys learn how to be sailors – and whalers – and hatch a plan to catch the ‘dragon’ once they reach the Azores. I won’t ruin the story for you, but Tim, Jaff, and Dan (a surrogate father to both of them aboard the Lysander) do eventually encounter and catch a dragon. It’s thrillingly exciting, but never quite clear whether the dragon is meant to a truly fantastical creature, or simply a Komodo dragon or some other large lizard fancifully misinterpreted by the minds of the nineteenth century. Either way, with the monster aboard, life on the Lysander takes a turn for the worst, and eventually, disaster strikes. I won’t give too much away. But here is where the meat of the story lies. And this is what I mean about a peculiar narrative arc – up until this point in the novel (just a little over halfway), the capture of the dragon has been the main focus of the story, gilded with fanciful, whimsical accounts of the islands and life at sea. At the start of Chapter 10, the remaining crew is adrift, dragonless, and facing the all too real prospect of being indefinitely stranded on the open ocean. The following hundred pages are slowly, quietly devastating. The peculiar stillness of the open ocean is a harsh contrast to the previous pages’ bright, colorful sense of adventure, and that stark, sudden contrast is in part what makes what happens out in the whaleboats so unsettling. After the swashbuckling fantasy of the first 170 pages, the misery of the last 120 is crushingly real. 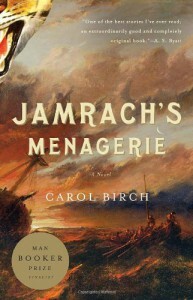 And here is where Carol Birch truly excels – in chronicling the slowly increasing desperation of twelve men lost at sea, succumbing one by one to hunger, thirst, disease and madness, and forced to do unspeakable things in order to survive. Birch somehow manages, in the simple delivery of details – sometimes gross, but never gratuitous – to help the reader understand how Jaff and Tim and Dan all arrive at the climax of the story, which is bound to leave both the characters and reader heartbroken and permanently scarred. The falling action is quiet and detached, and makes a cautious foray back into Jamrach’s colorful domain, but with a new-found sense of respect for the natural world. This is the kind of book that leaves you feeling traumatized. It’s a brutal story gently written – which makes it ten times more tragic than it would have been had Birch been foolish enough to sensationalize it. It’s not perfect, of course, but the catalog of flaws is short. Sometimes the story drags a little bit, generally when the Lysander is moving from one island to the next. A few incidents early in the story (Jaff’s being trapped in Jamrach’s shop for the night, for example) seem very important but are never addressed again. Despite being called ‘Jamrach’s Menagerie,’ Jamrach isn’t actually present for 90% of the book. To buy Jamrach’s Menagerie on Amazon click here. To find it on Goodreads, click here.